In the early 1800s, Robert Jamieson, a Scot teaching in Macclesfield and passing some lonely spare time translating some old Danish ballads, noticed some curious resemblances between the one such's story and a tale he'd heard as a boy from a packman. Both told of a girl, in each case an Ellen, stolen away by an Otherish being. At the time, Jamieson was also busily compiling a massive collection of Scottish ballads, and became convinced that among them he had found the sequel to this episode. Widely distributed, in many variants, it told of the ordeals of a girl, again usually Helen or Ellen, at the hands of an uncaring impregnator. Whether pregnant or already having his child, she is set a series of humiliating tests by which she would finally achieve acceptance and recognition for herself and her child at his family dwelling or stronghold. This, thought Jamieson, completed a fragmented Ellen epic. The ballads and extracts reprinted here variously illustrate Ellen's subsequent ordeals, providing the modern reader with a dark glimpse of some of fantasy's deepest and most abiding roots. 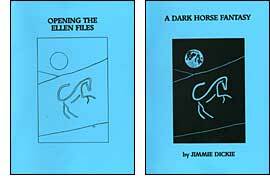 Published in an upside-down-and-back-to-back format with a long poem by Jimmie Dickie that similarly draws its inspiration from the traditional folk tales and ballads of his native Scotland, which so inseparably entwine the lives of our world with the invasive strangeness of the realm of the Other.